 100% high density knitted polyethylene design. 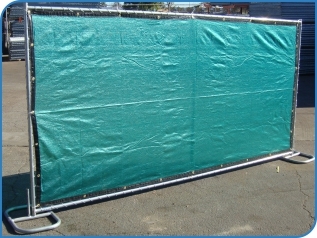  Water and UV resistant fence fabric.  Material fabricated with reinforced binding and grommets all 4 sides.  Ideal for construction & commercial projects.  Colors available in Green.  Material weights 90g/m2, 110g/m2, 145g/m2.  Material break strength at 500 lbs per ft.